Check out OneTrueSaxon.com for truly stylish clothes. They believe fashion is transient, style is timeless. From outerwear to denim, from tees to knitwear, you're sure to find something that suits your style. Save on your purchase with discounts and savings found here on VoucherGurus.co.uk. Shop at OneTrueSaxon.com and you can save up to 70% off sale apparel including outerwear, denim, tees, and more. Act now and take advantage of free international delivery when you spend £250+ at ONETrueSaxon. 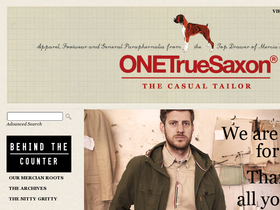 Spend £100 or more on OneTrueSaxon and you'll qualify for free delivery.